Can this 2015 Rolex Sydney Hobart become any more convoluted – is Steven Spielberg directing this thing? Last night the race was turned on its head when the American super maxi Comanche hit something off the NSW south coast and sheared off most of her starboard-side daggerboard and rudder. 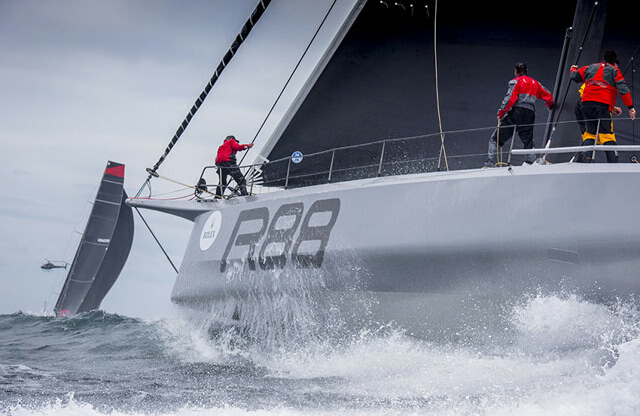 This, just hours after the withdrawal of her principal Australian challenger, Wild Oats XI, should have been the defining moment of the dash for line honours. Comanche’s compatriot rival, Rambler, seized the moment, scooting past into the lead, opening a six-mile lead over the pre-race favourite. Comanche’s skipper Ken Read pressed on anyway, determined to at least to “finish this damned race”, but surely line honours was now beyond the stricken super maxi. Except, this afternoon, Comanche staged a dramatic comeback, slowly reeling in her smaller rival, and eventually regaining the lead. What was happening? Had the guys on Comanche pulled off some sort of miraculous jury rig? Not quite. Somehow, in the vast sweep of Bass Strait, Rambler had found her very own submerged object, twisting and bending her starboard side daggerboard. “We have no idea what we hit, we couldn’t see it,” Rambler’s Australian navigator Andrew Cape said by satellite phone a short time ago. “It might have been marine life or flotsam, but it was a solid hit. It shook the boat. Cape estimates that they have lost about 10 percent of their speed on port tack and, because they can’t lift the daggerboard, they are losing a bit on starboard tack as well. “It’s tricky,” Cape says, “ä serious structural problem impeding our boat speed. So right now we have an American two-horse race, and both horses are running with broken legs. The same broken leg. Meanwhile, the last standing Australian super maxi, Ragamuffin 100, is slowly closing in. At 30 miles astern of the race leaders this afternoon, her close duel with the Italian V70 Maserati looked to be a fight over third place. Rags has cut the deficit to 26 miles, and there is still a long way to go to Hobart. Will the Americans stagger up the Derwent side by side? Will Ragamuffin 100 pull off a home-town upset? Or could Maserati? Is there a malevolent sunfish roaming Bass Strait, looking to strike again? If it was in a movie you wouldn’t believe it.